NVIDIA has launched their first gaming notebook GPU in their 500M series, the new GeForce GTX 560M. It supports DirectX 11 and is said to deliver a “no-compromise gaming experience at full 1080p resolution”. The 560M will have support for a variety of NVIDIA’s technology, starting with Optimus, which allows it to switch itself off when not required, to save battery. It also supports 3D Vision technology for 3D gaming, PhysX support, CUDA architecture support and NVIDIA SLI technology. The new 560M is claimed to be twice as fast as the 555M. 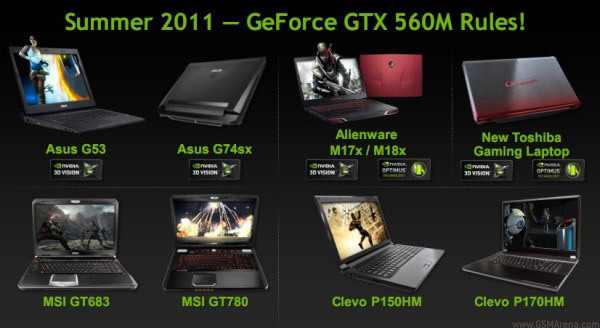 NVIDIA already has a long list of major notebook manufacturers under its belt that will be coming out with notebooks running on the GTX 560M. This includes Alienware, ASUS, Clevo, MSI and Toshiba. In fact all of them already have models ready that run on this new hardware and NVIDIA is even giving you a chance to win the new ASUS G74sx, that not only has the new 560M but also a 3D Vision sensor and 3D display built-in, so it’s 3D-ready out of the box. Check out the video below for more details on how to enter the contest. NVIDIA has also announced new entry-level GPUs in the 500M series, names the GT 520MX. It is designed for thin and light notebooks and is claimed to be a step ahead of the existing 520M GPU while offering more advanced features and better performance over the integrated Intel HD Graphics 3000.